Some articles I have written, plus letters about the number of Esperanto speakers. Why “The international language that works!” is an effective “service mark” for Esperanto. Some notes on “selling” Esperanto. Reply to article about the number of Esperanto speakers: Two million speakers. Suggestions for useful handouts available from ELNA. Esperanto table / display items: what to have when you’re getting ready to display at a cultural festival or similar. Three letters from Professor Sidney Culbert (English originals). Tri leteroj de Prof-o Sidney Culbert (tradukitaj al Esperanto). 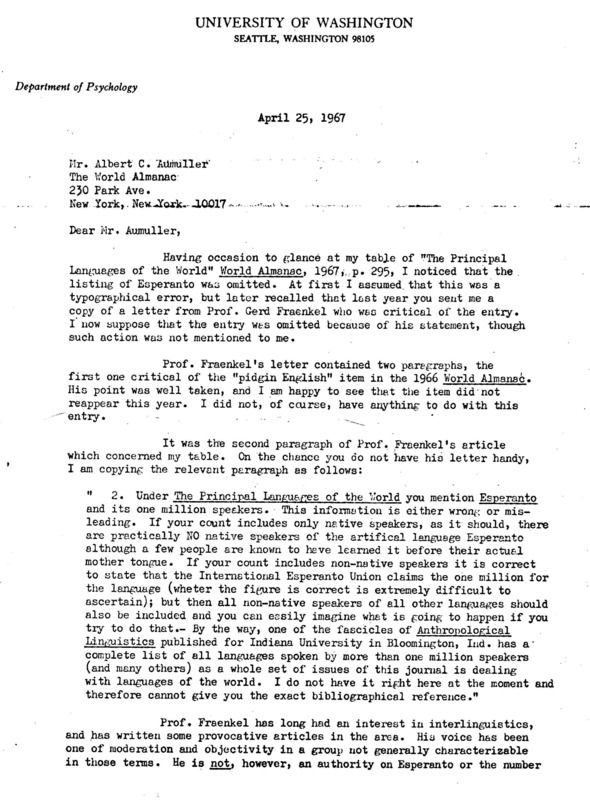 And a scan of one page of the 1967 letter (430KB). Some notes on why I resigned from the ELNA Board of Directors. A rant on local Esperanto groups in the US. Notes on the reversed Richardson dictionary fiasco. Article on the Richardson Book project. A little WWW service for people who can’t spell (or perhaps can’t type). Ewmew Fudd wites Espewanto: Leteŭo pŭi espŭoŭ-metodoj, he-he-he.